Nearly 500 Iowans who cashed a so-called "rebate" check sent to them in the mail may have unknowingly signed up for repeated credit card charges. Between 2004 and 2007, hundreds of thousands of Iowans received an official-looking mailing labeled "Rebate Check Enclosed." Four-hundred-ninety people cashed the check and most did not notice fine print which enrolled them in the Credit Card Protection Agency. The CCPA membership resulted in automatic credit card charges. 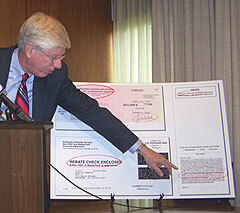 Iowa Attorney General Tom Miller says the company, in return, offers relatively small discounts at retail outlets. "You get these wonderful benefits that they’re providing for a month and then if you don’t affirmatively tell them you don’t want them anymore, then you’re charged 89 dollars," Miller said. "You’ll be charged that 89-dollars each year until you tell them you don’t want it." Miller says the mailings violate Iowa’s Consumer Fraud Act which prohibits deceptive and unfair marketing practices. He says even the company’s name is deceptive. "They provide little or no credit card protection. It’s mainly a buying club," Miller said. He claims the CCPA never adequately disclosed the fact that cashing the check would result in a membership and credit card charges. "It’s a slide-me-by sort of effort and the key to it is sliding a charge by you on your credit card statement. It’s very important that people look at all their charges and make sure they’re legitimate and if they’re not, challenge them," Miller said. He says the CCPA has agreed to mail refunds to Iowans that range from $89 to $139. Today, the attorney general is sending letters to the 490 Iowans involved, explaining how they can obtain the refund.